Are you making YouTube videos for your business? If not, you should be. Not only is YouTube the world’s second largest search engine after Google, but consumers are also growing to expect businesses and brands to have a YouTube presence. 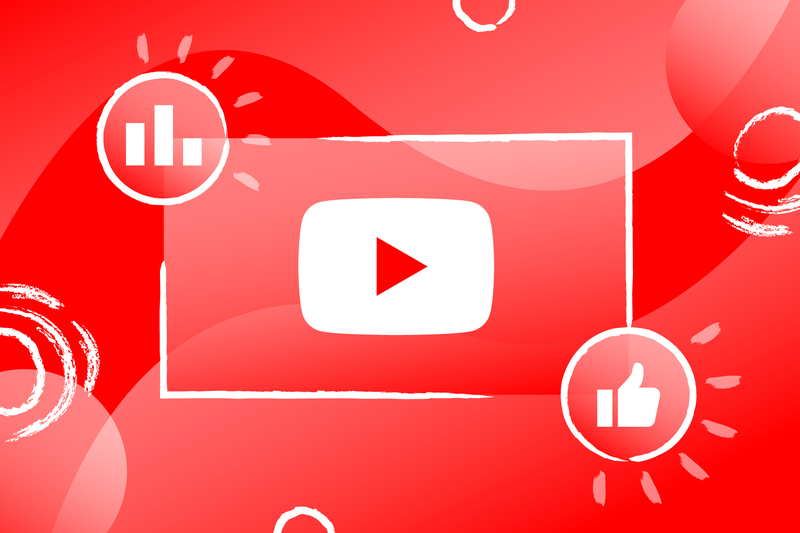 This guide to YouTube marketing has everything you need to get started with using YouTube for your business, from setting up your YouTube channel to optimizing your videos, running TrueView ads, and more. Click through to jump to any section on the table of contents below, or read through the full guide for an overview of all things YouTube marketing. Let’s start with a quick definition what YouTube marketing is. Basically, YouTube marketing refers to a variety of strategies and tactics used by businesses to make money, drive traffic, spread brand awareness, and achieve other marketing objectives on YouTube. YouTube content marketing: Content marketing on YouTube refers to videos designed to educate, inspire, and entertain, rather than directly promote your product. In fact, they may not mention your product at all! Rather, they are designed to get your business in front of prospects that are searching for topics and asking questions related to your industry. YouTube product marketing: Product marketing on YouTube refers to any videos you post about your product or service, specifically. These videos are teach potential customers about your offering and can include anything from product reviews and testimonials to demos, tutorials, and everything in between. YouTube advertising: Advertising on YouTube refers to any video that you pay to put in front of a targeted audience. Videos that you upload to your channel and do not pay to advertise are referred to as organic. There are a variety of ways to advertise on YouTube, which we’ll get into a little later on in our section on YouTube ads. YouTube influencer marketing: Influencer marketing is big on YouTube. It refers to the act of a brand paying someone with a large YouTube subscriber base to promote a product. Not convinced that investing in YouTube is the right move for your business? Here are a few reasons why we think it’s high time for your business to embrace YouTube as part of your marketing strategy. YouTube has over one billion users, which is nearly a third of the internet. YouTube is localized in 91 countries and 80 different languages. Whatever your business and whoever your customer, the odds are good that they’re searching for information on YouTube. Potential customers are searching for all sorts of things, from tutorial videos to product reviews. And you can get discovered by potential customers if you’re there to answer their questions and give them the information they need. The trend of searching YouTube is only growing with younger generations. According to Think with Google, "In the past year, 70% of millennial YouTube users watched YouTube to learn how to do something new or learn more about something they're interested in." Here’s an example. This video answers a common question in the real estate world: How should you price your house? By sharing a video like this one, a real estate agent could be there to answer a question being asked by potential new clients. Think with Google also shares that more than 50,000 years worth of product review videos have been watched over the last two years—and that’s just on mobile. Video is now being used throughout the entire customer journey. Shoppers are checking out reviews to help with purchase decisions and they’re looking for video tutorials as a replacement for written instruction manuals. You have the opportunity to be the source for videos about your business and construct the narrative. If you’re not there, who knows what’ll show up at the top of search results when people are looking for information about your business, products, or services. On their informational page about YouTube advertising, YouTube shares that the number of small- and medium-sized businesses on the platform has doubled in the last two years. More and more brands and businesses are jumping on the YouTube bandwagon. The good news? It’s still early and getting started now can give you a leg up over your competition. Head over to YouTube and do a search for your competitors to see what comes up. Check out some search terms related to your industry or business type. What shows up at the top of the results? Viewers on YouTube are more prepared to consume organic videos from brands. But that’s not all. This also means that viewers are more willing to watch ads in order to get to the content they want to watch. And Google research shows that the attention to advertising on YouTube, on mobile specifically, is higher than on television. For more YouTube stats, check out our collection of up-to-date video marketing stats. If you’re just getting started with YouTube marketing, one of the first steps is creating a YouTube channel for your business. Creating a YouTube channel is free and easy to do. Here’s a quick checklist to help you get set up. YouTube is a Google service, so you’ll need a Google account in order to create a new channel. If you don’t already have a Google account, head over to accounts.google.com to create one. Once you’ve got an account, head over to youtube.com and log in to get started. Next, head over to your channel list. Then click on this link to go to your channel list. You’ll likely already see your own personal channel, tied to your Google account. If you already have a brand account, you’ll skip this step. 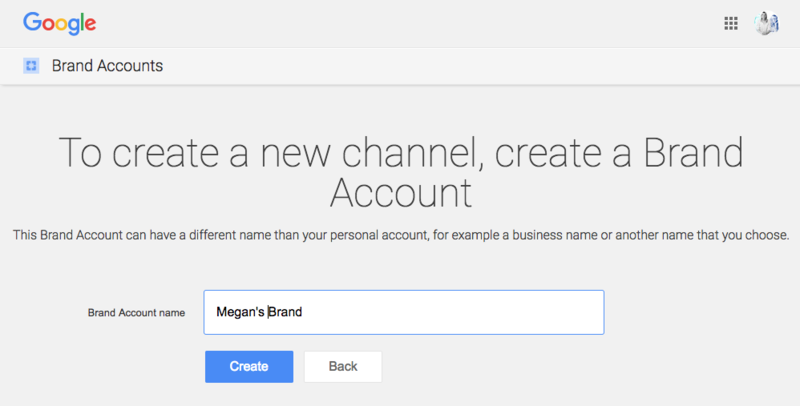 Click on "Create a new channel" and you’ll be prompted to set up a Brand Account to create your new channel. This new channel will be tied to your Google account, and you’ll log in with your email, but it’ll have a new name. Give it the name of your business. To continue, you’ll have to verify your account with a code, sent by text or a voice call. Once you’ve done that, you’re channel is created! Once your channel is created, you’ll want to add some channel art to make it look nice, plus a description so potential customers will be able to find you. Click the CUSTOMIZE CHANNEL button at the top of your new channel page to get started. Once you’ve clicked to customize, you can click on Add channel art to add imagery to display in your channel header. The recommended size is 2560 X 1440 pixels and the maximum file size is 6MB. When you upload your art, you’ll see how it looks across different devices, including desktop, TV, and mobile. Since your channel is tied to a brand account, you’ll have to update your Brand Account details in order to update your profile picture. Once you do, it may take a few minutes but your image will be updated on your YouTube channel as well. 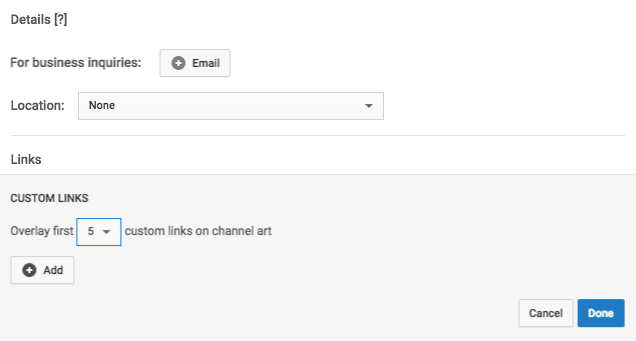 Once you’ve got your channel looking good with artwork, it’s time to add a description. Click on the "About" tab on your channel page to do this and then select "Channel description." Your description can be up to 1,000 characters and will appear when visitors check out the About page on your channel. Include keywords in your description that are relevant to your business and what your customers are searching for. From the same page, you can add links and contact details. If you’re a business owner, it can be helpful to add a contact email where potential customers can contact you, so be sure to include an email that you or your team checks on a regular basis. When you add links, you can select a title that will appear for each link that viewers will click on to go to the link you select. 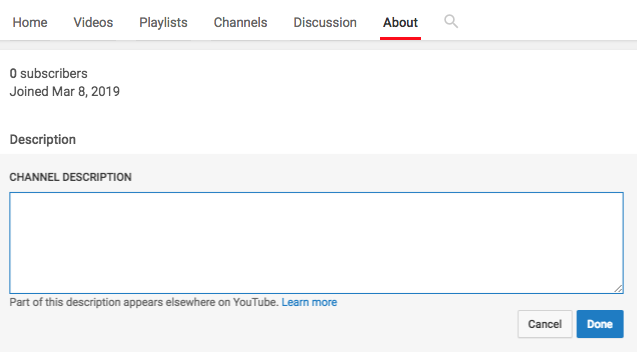 Links will appear beneath your channel description on the About tab of your channel. You can also have more prominent links overlay on your channel art. This is a good place to add links back to your website, as well as to any social profiles you may have, including Twitter, Facebook, Pinterest, and more. Now that your channel is all set up, it’s time to start uploading videos! We’ll show you how to upload videos from a computer. Uploading videos to YouTube is easy. Just log in to your YouTube account to get started. If you created a Brand Account, just make sure you’re logged in to that channel rather than your personal one. You can do this by clicking on your profile image in the top right corner of the screen, clicking "Switch account," and selecting the channel you’d like to use. Step 2: Select "Upload video"
At the top of the screen you should see a little icon that looks like a camera with a plus sign in it. Clicking on this will give you the option to either upload a video or go live. Click on “Upload video” and then select your file. Once you upload your file, you’ll be taken to a screen while your video processes where you can add a title, description, and tags. You can read more about that in the next section of this guide on optimization. On this screen, you’ll also be given some options for your video thumbnail. Select the one you like best. Under "Advanced Settings," add additional information, including category and language. When you’re done, click Publish and your video will be live. If you’re posting videos on YouTube — whether they’re videos to promote your business, videos to show off your talents, or videos featuring your family and friends — you probably don’t want them to sit unwatched, collecting virtual dust. You want them to be seen! What can you do to stand out? We’ve compiled a quick guide to video SEO to help you optimize your video metadata so that you can maximize your chances of getting discovered on YouTube. Metadata is any written data that adds context to your video. For every video you upload, at a bare minimum you should always be adding a title, description, tags, and a category. The form where you can add each of these will pop up as soon as you begin uploading your video to YouTube. Keep your titles short and to the point and include relevant keywords up front. This will ensure that they stand out and are easy to digest by potential viewers scrolling through search results. Your titles can be up to 100 characters, but try to keep them to 70 characters or fewer (including spaces) so that they’ll fit on a single line in search results and not be cut off. Be succinct at the beginning of your description as well. Include a single sentence up front that explains what viewers can expect when they watch your video, and keep it to 150 characters or less so it won’t be cut off in search results. The below description is an example of how you can let potential viewers know, in a very small number of words, what a video is about. After you’ve crafted a short sentence to describe what you’re video is about, you can add extra text in the description for added SEO benefits. This text will be hidden unless viewers click on “Show More” but will still help viewers discover your video. Your full description can be up to 5,000 characters long. PRO TIP: Include translations of the description in other languages, if you think your content will appeal to people who speak those languages. When tagging videos on YouTube, think of keywords and phrases potential viewers might search for that would be interested in your content. Include common misspellings as well. Just remember that you should only use tags that are actually relevant to your video, or it may hurt your search ranking. Tags can be up to 30 characters each, with a total of up to 500 characters in the tags section. Don’t forget to click on "Advanced Settings" to select a category for your video. YouTube’s category selections include things like Autos & Vehicles, Comedy, Education, Entertainment, Pets & Entertainment, and Science & Technology. Select the category that makes the most sense for your video. Your video thumbnail isn’t officially “metadata,” but it will help drive traffic to your video once your metadata helps your video show up in search results. Select an eye-catching image that represents what your video is about. When you upload your video, YouTube will give you three thumbnail options. Choose the most appealing or, if your account is in good standing, you can create and upload your own thumbnail. Just remember that your thumbnail needs to accurately portray the content of your video. Playlists are a great way to get a little more SEO juice on YouTube. When you create a playlist, you include a title and description as well. This helps surface your playlist (and all the videos in it) in YouTube search results. Creating themed playlists is also a great way to get viewers to stick around and watch more of your videos. A more advanced way to beef up your metadata game is to add captions and subtitles to your video. According to YouTube’s Creator Academy, “These files are indexed and broaden your audience to non-native language speakers and viewers who are deaf and hard of hearing.” Read more about how to add captions and subtitles in the YouTube Help Center. Finally, it’s important to note that your metadata is never set in stone. You can always go in and update your titles, descriptions, tags, thumbnails, and more if you aren’t seeing the results you’d like. When you first get started with YouTube marketing, one of the toughest things is trying to figure out what videos to make. We’ve got a list with 21 YouTube video ideas, which we encourage you to check out. For the purpose of this guide, we’ve selected five YouTube video ideas for beginners that can serve as a solid foundation for building out your YouTube channel. Start with a video to introduce yourself. This can be posted as a channel trailer for new potential subscribers to get a better idea of who you are, what you stand for, and what type of video content they can expect from you. To learn more, check our our blog post on best practices for YouTube channel trailers. Remember: your customers are searching to find the answers to questions related to your industry and business. Creating an explainer video about the concepts your potential customers are searching for most can help you get in front of them and share your expertise. Explain the answer to an FAQ, your business or offering, or an industry trend, as in the example below. YouTube is a go-to these days for people looking to learn how to do things. And you can show them how, when it comes to your product or industry. Share a video tutorial or how to that showcases your expertise and provides value to viewers that may decide to do business with you in the future. Remember when we shared that over 50,000 years worth of product review videos have been watched in the last two years? That’s where this idea comes in. When someone searches for a review of your business, one of your products, or your service, you can be there to serve up a testimonial from a happy customer. If you don’t have footage of your customers, that’s ok. You can put together a video using images and text reviews from Yelp, Google, or other review platforms. Last but not least, try creating and running a YouTube ad. Diving in will help you familiarize yourself with the process and get a sense of what YouTube advertising can do for your business. Animoto Professional and Business plans include a selection of YouTube TrueView video templates that make it easy to get started. We mentioned this at the beginning of this guide, but YouTube video advertising refers to paid marketing efforts on YouTube. YouTube offers a variety of options when it comes to video advertising. We’ll take a quick look at three types of YouTube ads. For a deeper dive, check out our guide to the essential YouTube ad types. TrueView ads are the ads you most commonly see on YouTube. They are skippable and are called TrueView because, as an advertiser, you only pay YouTube when viewers stick around to watch for at least 30 seconds or interact. These ads can be anywhere from 12 seconds to 6 minutes. Our video template for a TrueView ad was showcased as the YouTube ad in our video ideas section up above. You can use it as a formula for creating a video for your own business. Drag and drop your own video clips or photos, update the text, add your logo, and you’re good to go. If you’re looking for tips, you’re in luck. Check out our checklist for creating YouTube TrueView ads that convert. Bumper ads are short, 6-second ads that play quickly before a video begins. They can work as standalone ads for brand awareness or paired with other types of YouTube ads, targeting the same viewers to reintroduce your brand and message. Here’s an example of a bumper ad that pairs with our TrueView ad video template. A remarketing ad is designed to reach viewers that have already engaged with your brand in some capacity. This could mean they’ve visited your YouTube channel and watched your content, searched for you, or visited your website, among other actions. If you’re ready to get started with YouTube advertising, we’ve put together a beginner’s guide to YouTube ads to help make it easy. If you’re just getting started with YouTube marketing, some tips will come in handy! The first rule of thumb is creating quality content on a consistent basis. But there’s more to it than just that. In our inaugural Social Video Marketing Summit, YouTube strategist Tim Schmoyer, of Video Creators, shared nine tips for growing your YouTube channel. Check out the video from our Summit and then read on for the tips. First things first, you should have a clear idea of who you are trying to reach — both with your channel as a whole and with each individual video. "What value to do you propose to deliver to your audience through your channel?" Tim asks. You need to very quickly address your audience and pitch the value behind watching your video if you want people to stick around. On YouTube, an enticing thumbnail is very important when it comes to getting people to watch your video, as this is the first thing they see. Even if you don’t have a lot of design resources at your disposal, it’s important to select the most visually appealing thumbnail image you can, in order to capture attention. An enticing title is just as important as a thumbnail when it comes to getting people to click through and watch. Make sure your title includes the benefit the viewer will get from watching your video. If the value doesn’t come across until several minutes in, you’ll lose your viewer. You need to show value within the first 15 seconds. And value shouldn’t be reserved for just the first 15 seconds. You need to present value all the way through your videos. How long should your videos be? Tim says, "Take as long as you need to deliver the value that you want to deliver and not a second longer." Tim asks, "What action do you want the viewer to take as a result of watching your video?" Don’t end the video without letting them know. He recommends not adding more than two calls to action. When writing your description, keep your keywords in mind, but include them in a conversational manner. Tim suggests writing a paragraph or so. Tim suggests imagining you’re telling a friend about what your video is about. What 1-word and 2-word phrases would you use? These should be your tags and he suggests using around 8 to 15 of them. You know why your business needs to be on YouTube. You're armed with ideas for videos to create. Now it's time to get started—and we're here to help! An Animoto subscription gives you everything you need to drag and drop your way to powerful and professional marketing videos. With customizable video templates, designed with success in mind, you can create your own videos in minutes. With over a decade in the industry and partnerships with YouTube, Twitter, Facebook, Instagram, and LinkedIn, Animoto is used by more than 1 million businesses worldwide. Try it for free today or learn more about using Animoto for YouTube videos. Happy video making!